Regicide was a serious crime in medieval times. 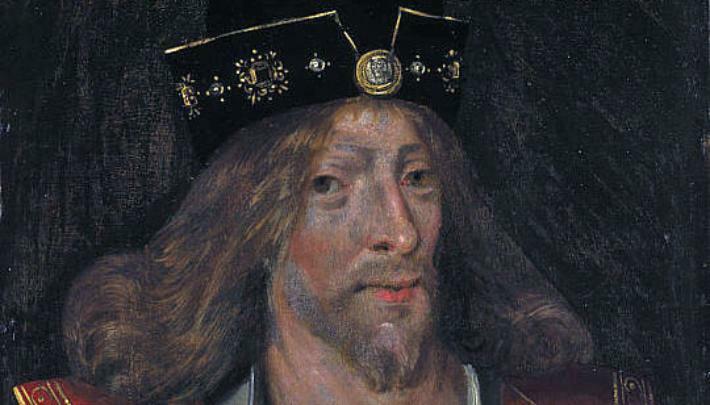 There are many versions telling the story of the assassination of the King of Scots, James I. Earlier versions vary from versions written well after it happened. This could be attributed to Queen Joan who was actually there when it occurred. She survived and wanted vengeance. She may have had the story told as she wanted it known to make her husband appear to be more of a martyr. Here’s the story as The Freelance History Writer can best piece together from several versions. James had been held prisoner for nearly nineteen years by the English king after being captured as an eleven year old boy. When his release was finally completed and he returned to Scotland, he inherited a kingdom in disarray, ruled by some of his relatives and other nobles. His first actions were to emphasize his rights as king and make clear he wanted complete power. He proceeded to have his cousins who might assert their claim to the throne imprisoned or executed. He ruled with an iron hand for thirteen years and made many enemies. These enemies began to plot the king’s death. They finally managed to execute their plans. Perth was a favorite city of King James and he may have considered making it his capital. James had spent Christmas at the Blackfriars monastery and tarried there afterwards, playing lots of tennis, possibly in an effort to reduce his weight. On the evening of February 20, 1437, James was resting in his nightgown and slippers, maybe playing chess or cards or just bantering with his Queen and her ladies. They suddenly heard a great clamor of harnesses outside and saw torches. Queen Joan and her ladies went to the door and found it had been tampered with and was open. One of the conspirators, Robert Stewart, may have prepared the door ahead of time by breaking the locks. James asked the women to keep the door guarded as best they could while he looked for means of escape. He tested the windows, but they were strongly leaded and would not break. He then went to the chimney and grabbed an iron tong and began to pull up floorboards. Underneath was a vault or a cellar or a privy. At the very least this space had a drain for the privy and he hid there and replaced the floorboards. He could have escaped through this drain but he had the opening blocked just days before. He kept losing tennis balls down the drain so he stopped it up. In the meantime one of the Queen’s ladies, Catherine Douglas by name, had used her arm to try to bolt the door against the intruders. When the assassins broke down the door with saws, levers and axes, they supposedly broke Catherine’s arm. The ladies were screaming and several of them were injured, including the Queen. There was a moment where she might have been killed but someone said they should go after the king and left her. She managed to run and escape the monastery. The assassins searched high and low for the king and could not find him. They searched for so long, the king thought they had left and cried out to the ladies to come help him out. Then one of the conspirators either heard his cry, or remembered the privy and they returned to the room and noticed where the floorboard had been lifted. They pulled up the boards and found the king. One man jumped in to attack the king with a knife. The king supposedly grabbed this man by the shoulders and threw him down. A second man jumped in and attacked. The king is supposed to have grabbed this man by the throat and tossed him down next to the other man. In the fight, James’ hands were torn up by the knives. He was weary and wounded and he had no weapon. James’ most hostile enemy, Sir Robert Graham then attacked the king and ran a knife through him. The other two attackers the king had thrown down rose up and stabbed the king. He was helpless with no weapon to fight back. It is said there were at least sixteen wounds on the king and he finally succumbed to his assailants. The people of Perth had heard about the commotion and headed for the monastery. The conspirators then fled. They didn’t get far. They certainly had no plans for the aftermath of the murder and didn’t count on the wrath of the queen. Joan made sure her son was safe, established the support of some powerful men and called for the apprehension and arrest of the assassins. She had James’ butchered body displayed before he was buried in the Carthusian priory in Perth. The hunt began for the assassins. They were all captured. Some of them may have been tortured but they all were executed. Joan made her way to Edinburgh and had her son James II crowned at Holyrood Abbey on March 25, 1437.